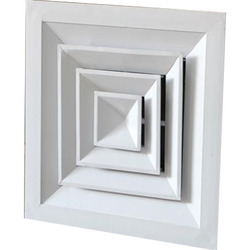 Leading Manufacturer of aluminum and pvc air diffuser, industrial square diffuser, square diffuser, rectangular diffuser and aluminum diffuser from Ahmedabad. 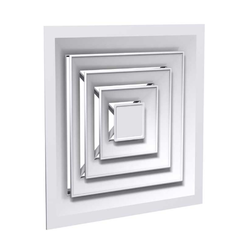 We are engaged in offering our clients a very genuine range of Aluminum and PVC Air Diffuser. Our diffusers are made of a very high quality raw material and have a very unique features with itself. Our range is available at industry's leading price. With the assistance of our team of professionals, we are engaged in providing an excellent quality Industrial Square Diffuser. This diffuser is manufactured by making use of quality assured aluminum under the supervision of our deft professionals. The offered diffuser is widely used for aroma diffusion, air purification and humidification. Our experts also test this diffuser on various quality parameters before its delivery to the clients. We are one of the established companies in manufacturing and supplying wide range of finest quality Square Diffuser which are extremely engineered by our talented team. These are used in applications of air management. These diffusers are highly on request in India as it is exclusively intended to come up with the necessities of clients for diverse manufacturing applications. 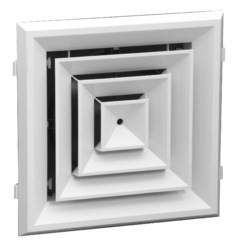 These square diffusers are used to control the outline of the airflow into an engaged gap. These are available to our clients in different styles and sizes. With our continuous growth in the field of manufacturing, we are able to expertise in manufacturing and supply finest quality of Rectangular Diffuser in the market. These are generally suited for gathering on ceilings. These are among the most versatile diffusers available in the market. We are providing a wide range of rectangular diffusers which are able to adapt easily to any situation in observation of its efficient design. These rectangular diffusers are greatly in demand for it easy availability and different patterns. We make use of extruded aluminum section to fabricate a precision-engineered range of Aluminum Diffuser. These aluminum diffuser are fitted in the offices, godowns & factories and are used for throwing equal air to individuals in an appropriate manner.